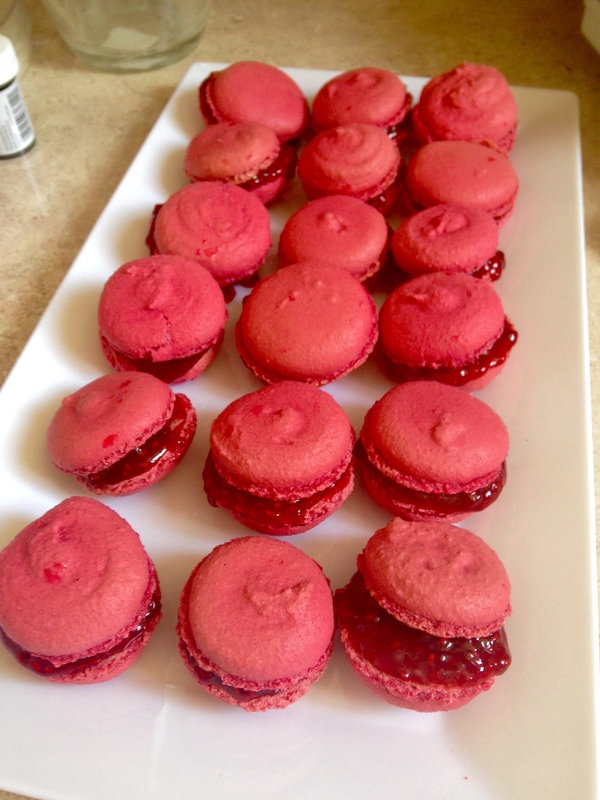 Here is another macaron recipe using my go-to base recipe and with a delicious tangy raspberry filling. Enjoy! Whisk egg whites until doubled in size using electric beaters or an electric stand mixer. While still whisking, gradually add caster sugar, bicarb and food colouring, whisking until mixture forms very stiff peaks. Spoon into a piping bag fitted with a 9mm round nozzle (approximately). Hold nozzle close to the baking tray and pipe 3cm diameter circles onto prepared trays – don’t make a circular motion à la soft serve. Tap the underside of the tray to allow macarons to settle and air bubbles to escape. If there is still a little peak on top, dip a teaspoon in water and use the back to smooth the surface. Leave to rest for 15-20 minutes or until the macarons form a skin (this is VERY important as it will give your macaron its lovely ‘foot’). 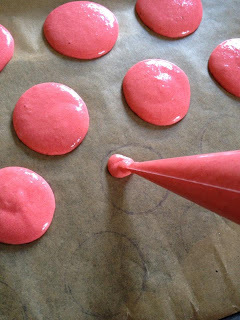 Once cool, remove from tray, pipe jam onto half the macarons and sandwich with a second macaron.